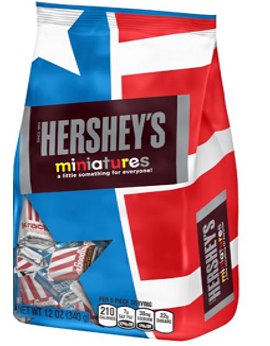 This summer, Hershey will once again bring their Hershey’s Miniatures Assortment to market in a special patriotic package. The assortment includes the usual miniature versions of our Hershey’s Milk Chocolate, Krackel, Hershey’s Special Dark and Mr. Goodbar chocolates; but to celebrate America, the outer bag and individual bars will be wrapped in red, white, and blue colored graphics that feature stars and stripes. As always, peanut allergic consumers should keep in mind that Hershey’s Miniatures assortment contains peanuts, which are clearly listed in the ingredient statement on the outer bag. In addition, the individual bar wrappers identify the variety inside. For example, the wrapper on our Mr. Goodbar miniature states “Milk Chocolate with Peanuts” (see picture below). We want food allergic consumers and their families to be aware of this seasonal change to the color of our Hershey’s Miniatures assortment to prevent any potential confusion about the allergen profile of the product and its appropriateness for consumers guarding against peanut allergies. Because ingredients, manufacturing processes or, in this case, packaging can change, we always recommend that consumers continue to read the labels prior to purchasing our products.